Should we always insist that children share their toys, space and time with everyone in every moment? Should we limit experiences for the whole class because one or two children are not interested? Should we tell children that they ALWAYS have to let everyone play their games? Saying things like, ‘Use your words!” or “You can’t say you can’t play!” roll very easily off the adult’s tongue, but what are these catchy phrases REALLY teaching our children? As adults do we ALWAYS include everyone when we plan dinner parties or movie nights? Do we ALWAYS share our favorite new shoes with anyone who asks, or let our neighbors borrow our favorite car? I don’t think so. And in not sharing our things as adults does it make us ‘bad, mean’ people? No. Because we ‘work for what we have,’ and ‘we value our belongings.’ But don’t children work hard every day to understand the world around them? Don’t they value their their special toys too? Why then do we insist that our children constantly share everything and include everyone? There are ways to teach young children that sharing, inclusion and being respectful to other humans are important practices. There are ways to encourage these behaviors without constantly forcing children to include EVERYONE and share EVERYTHING. We need to remember that children are NOT little adults- so we can not expect them to behave as such. We can not just walk up to arguing children and say things like, ‘Use your words!” then walk away with no explanation as to what it MEANS to ‘use’ those words. We can not expect young children to know how to ‘use their words’ if we do not first TEACH them those words, and in turn how to express themselves and their feelings verbally. A child’s brain is not developed to understand the concept of ‘sharing’ until around age 5 or 6. That is well in to Preschool, and even Kindergarten. Young children will ‘share’ their toys because teachers or adults tell them to, not because they understand that it actually feels good to share with their friends, and that “If I share my toys, my friends will share with me.” (Our brains are not developed to understand concepts like cause and effect until we are in our early twenties!!) I believe that when a child does share it is important to make a BIG deal about it. By saying things like, “Thank you so much for sharing that toy, I can see that your friend feels so happy that you shared, how do you feel when you share?” we can put that seed of understanding into a child’s mind- ‘When I share my friend feels happy, when my friend feels happy I feel happy.” I’m not saying you have to throw a part every time a 2 year old passes a doll to another child, but it IS important to make note of these milestones if we want to encourage these types of behaviors. There is a BIG difference between not sharing and being disrespectful. If a child is engaged in play by themselves, or with a small group of children forcing them to let another child, or children play (because “You can’t say you can’t play!” ) might disrupt their developmental learning through that play. Playtime is such an important part of learning for young children, if we, as adults, are telling children that they ALWAYS need to make their games something that can include EVERYONE we are limiting their individuality and growth, as well as the building of their friendships. We need to remember the importance of alone time and small group play. If one or two children are positively engaged in a game and a third comes along kicking and screaming that they can not join I would suggest helping the third child find another game to play.Redirection works!! In a different scenario two children may be playing a game and intentionally excluding other children- this is where the difference between ‘not sharing’ and ‘being disrespectful’ comes in. In these types of scenarios I believe it is important for an adult to step in and discuss why it is not okay to intentionally exclude. By explaining to young children how it feels to be excluded, “I know I feel sad when I get left out, how do YOU feel when you get left out?” we can validate their feelings and the feelings of their friends. Children are NOT little adults, but they are geniuses. They can understand empathy if we show it to them. Respect is learned, disrespect, unfortunately, is also learned. If children learn that they can get away with excluding others and pushing other children around when they are young they may become more and more socially aggressive when they get older. Bullying has become such a huge problem, if we can teach young children to care for their own feelings and the feelings of their friend’s maybe we can erase those aggressive behaviors later on. It is equally important to teach children about fairness in a way that will relate to the larger world. I believe that ‘fairness’ needs to mean that everyone gets what they NEED rather than everyone getting the exact same thing. Some children need to sit on your lap in order to focus during story time, others can sit by themselves. Some children might need an adult to rub their back at rest time so that they can get the sleep they need in order to grow, others can lay down and fall asleep on their own.Some children will be engaged in a wood block building project, others will have no interest and may be able to engage through a different sort of project. Think about this for a moment- as adults we decide when to wake up, what to eat, what to wear, where to work (for the most part), who to be friends with, who to date, where to live, what car to drive- the list goes on. What do young children get to decide for themselves? And when we take away their toy and force them to ‘share’ it with another child is it teaching them that sharing feels good, or is it teaching them that yet again they have no control over their lives? Our job as Early Childhood Educators is to meet the needs of our children in order to empower them to meet their own needs. We need to make sure that our lessons about ‘sharing’ and ‘fairness’ are exactly that- empowering. Through that empowerment we can teach children that they should share because it makes them happy, and not simply because the adults told them to. Recycled crayons are super fun and easy to make.I’ve kind of become obsessed with them recently, regular crayons are just too boring after these spruced-up recycled ones! 2. Break or cut crayons into small pieces (small enough to fit IN molds but not hang over the edges too much), with the Lego people crayons I had to smash the crayons into tiny bits using a hammer in order to fill the mold without overflowing. 3. Cover a cookie sheet in foil and place crayon-bit filled silicone trays on top to catch any wax drips and keep them from smelling up your oven. 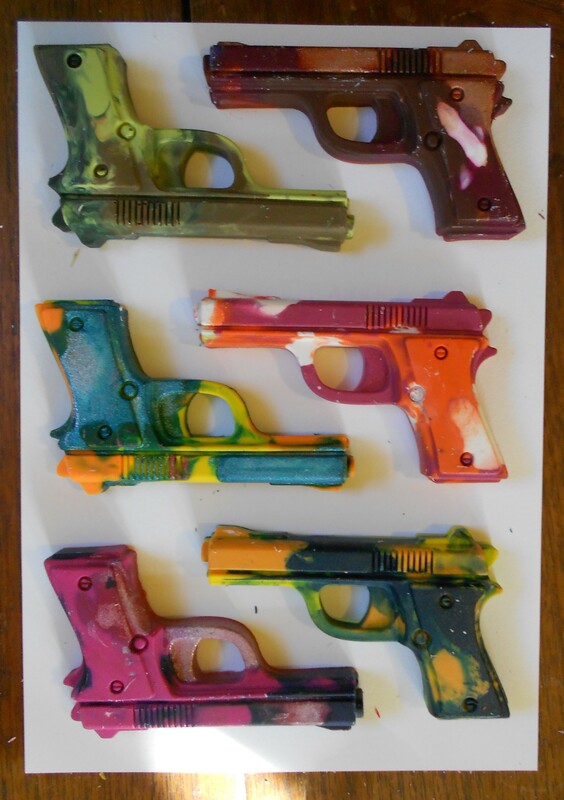 * If the molds seem only half-full of melted crayon after 10 minutes you can always add more small bits during melting process to fill them to the brim. 4. 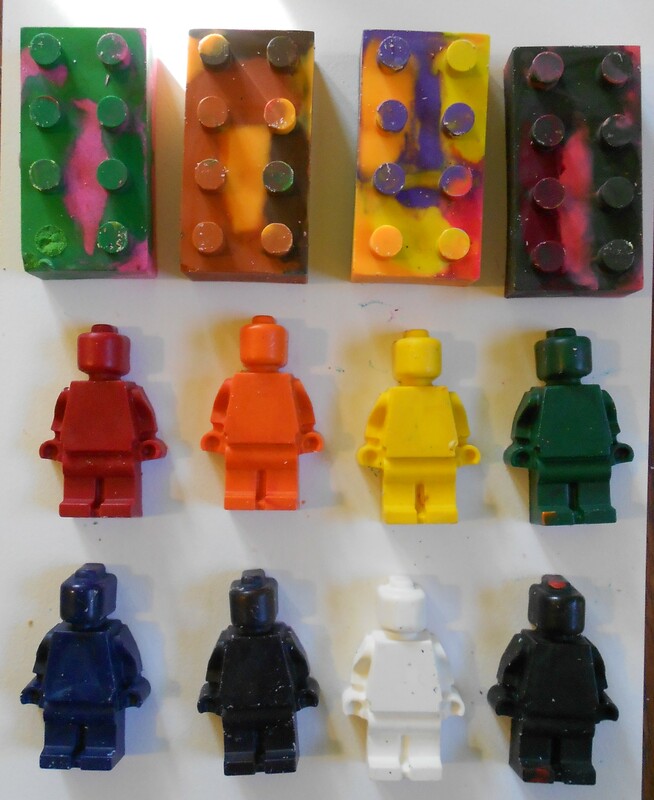 Let crayons cool COMPLETELY (anywhere from 20 minutes to an hour, depending on the density of the crayon mold) then press on the back of the molds to pop out your new- improved- crayons! Amazon.com has about a million different shapes of silicone molds available- some shapes work better for crayon making than others. Look for shapes without too many small, fragile parts to avoid breaking. I’ve had luck with these Lego bricks and men, as well as larger pistol shapes. Sensory experiences are how children learn about the world around them. This is a great (and super easy!) way to create a sensory activity for your home or the classroom. 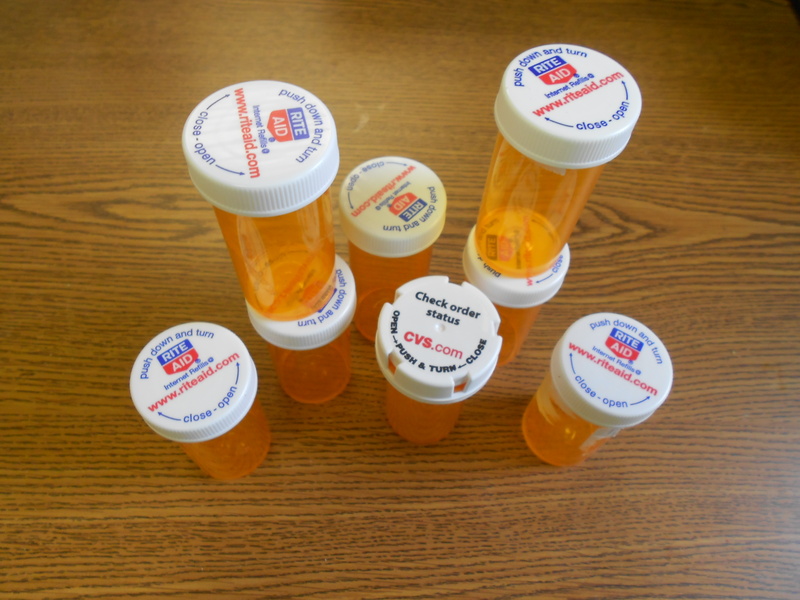 Using old medication bottles, a bit of construction paper and small items from around the house or classroom you can create a fun, educational sensory activity. 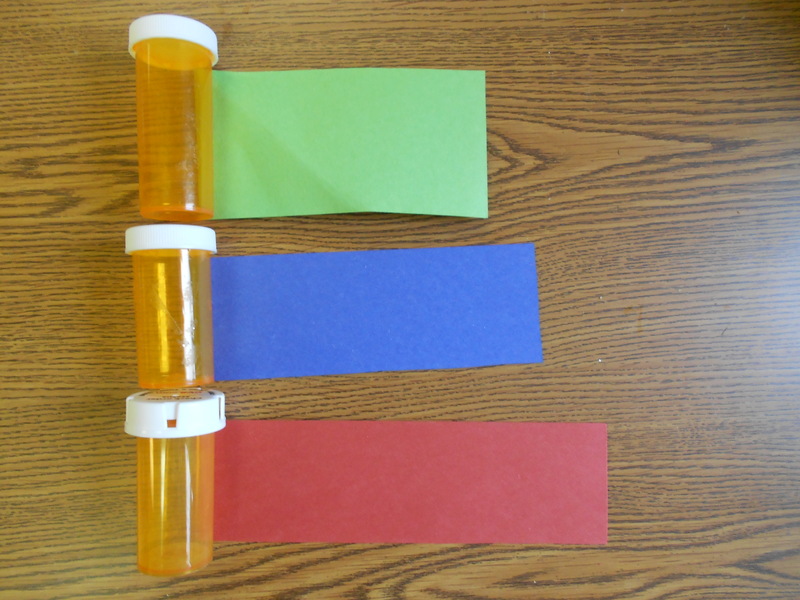 I used a different color of paper and number for each bottle so that the kids could identify and sort their colors and numbers while playing. a variety of small objects with different texture, weight and consistency to place inside- marbles, buttons, feathers, beads, screws, keys, corks, shells, pom poms, string, small toys, seeds, jewelry, stones, rubber bands, paper clips, magnets- anything that fits! 2.Cut a piece of construction paper the height of the bottle and long enough to wrap all the way around, tape one end to the plastic bottle then wrap around and tape the other end securely. 3. Trace the lid top and the bottom of each bottle onto construction paper and cut out to cover the whole bottle so the hidden treasures inside stay hidden! 4. Number each bottle so the children can easily identify them, as well as practice their numbers. 5. Select a variety of small items with different textures, weight and consistency, shells, buttons, corks, yarn, beads, keys and place one (or a few if it is beads, marbles, seeds) in each bottle. Click the lids tight- kids like to shake the heck out of them in my experience! 6. Have the children sit in a circle where everyone can see and begin a discussion about the 5 senses and what we use them for. 7. 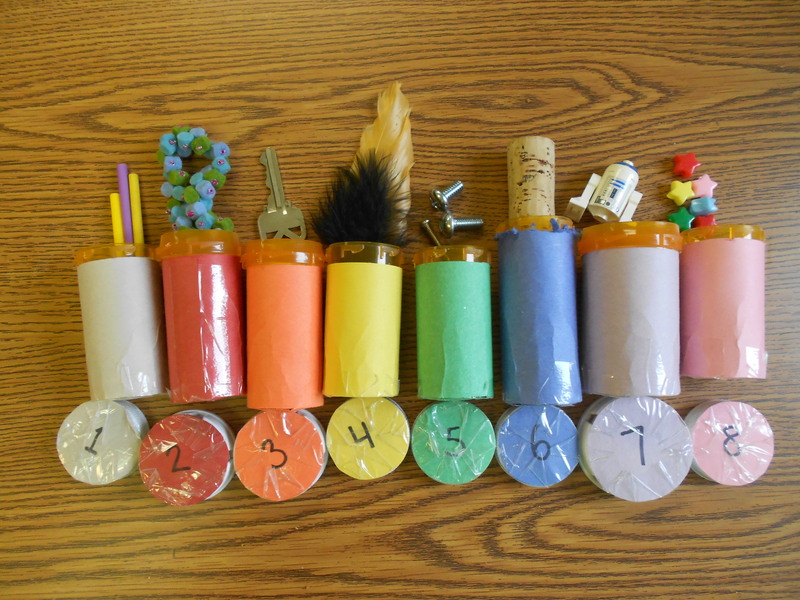 Pass around the bottles, one at a time- I start with the number 1 bottle- have each child shake the bottle and describe what they hear. Once each child has had a turn to shake the bottle and describe what they hear open up the bottle in question and pass around the item, or items, inside. Have the kids feel, describe, smell, (maybe not taste!) the items. 8. After all the bottles have been passed, shaken, described and opened you can ask the kids to talk about HOW they used their senses for this activity. How did we use our sense of smell? How did we use our sense of sight? How did we use our sense of hearing? 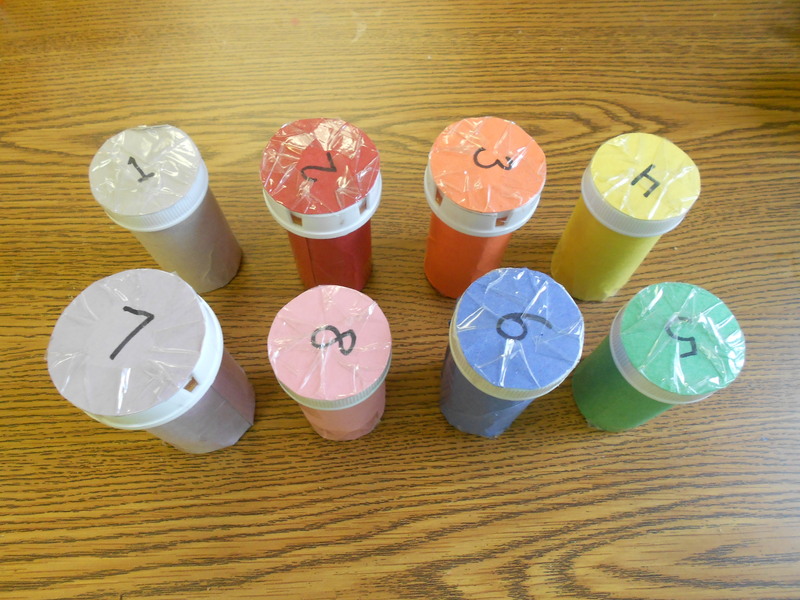 Sight- children use sight to identify the color and number of each container, as well as to identify items and describe what colors, textures, patterns, shapes they see on the items once the containers have been passed around and opened. Sound- when each bottle is shaken the item inside will make a sound (unless it is something sift- like a feather, which opens up a brand new discussion about how sometimes it SOUNDS like the bottle is empty but it really isn’t!) They can describe what it sounds like, compare to other things they have heard and try to figure out what the sound may be. Taste- this activity could be done using edible items like raisins, M&M’s, pretzels, if it is age and culturally appropriate (and sanitary) for the group of kids involved. Have kids taste test items and describe what it tastes like, is it salty? sweet? sour?